Birthdays are such a great excuse to experiment with baking and decorating! 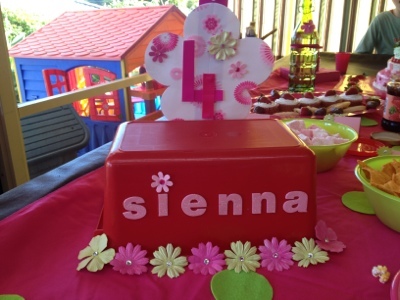 My darling little girl Sienna turned 4 yesterday and because she is such a sweet little girl that never wants for much, I decided to create something special….her very own sweets table! Sienna is the kind of child who you can take to the shops and she never asks for anything more than a $2 packet of chewy! She has always been like that. Right up until two days before her birthday she still hadn’t really asked for anything for her birthday, she was just so excited that she was turning 4! 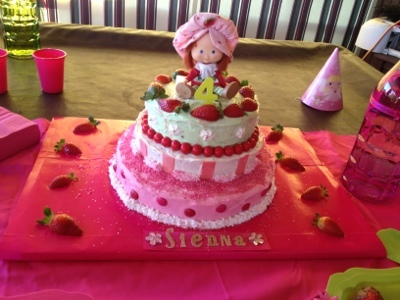 A few weeks ago, she finally decided she wanted a strawberry shortcake birthday cake, so with some google searches and some tweaking of my own I created her the magical strawberry shortcake birthday cake of her dreams! I don’t do big birthday parties every year for our children, we have selected years for that, but we always celebrate a birthday in one way or another. All Sienna wanted to do on her birthday this year, was have a swim at the Runcorn Pool, have a BBQ and jump on her jumping castle! That she did. 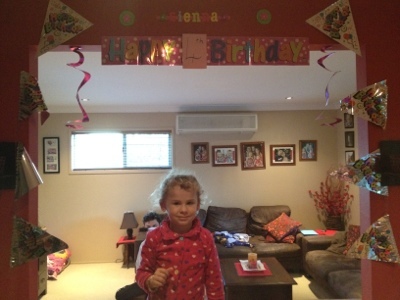 But I still felt bad because this was the year for her brother and sister to have birthday parties! 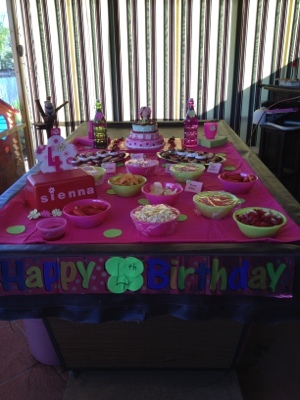 One way to Sienna’s heart is food and sweet food at that! Sweets/dessert tables are so much fun and I thank my friend Michelle Shaw for her inspiration of them! 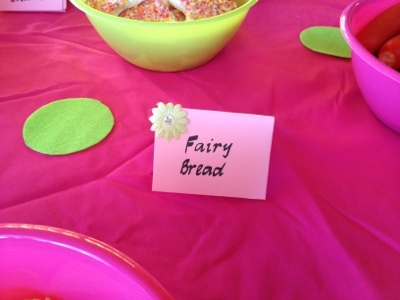 Because of the strawberry shortcake theme cake, I based my table theme, colours and food around that! The colours I choose were hot pink and green with flowers for a touch of decoration and the food was either strawberry related or pink in colour. 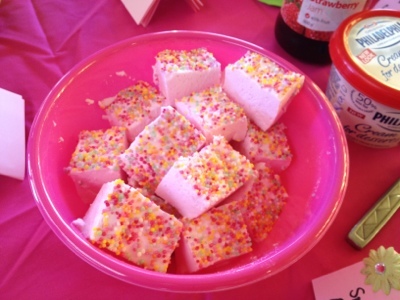 Home made marshmallow….so easy to make! 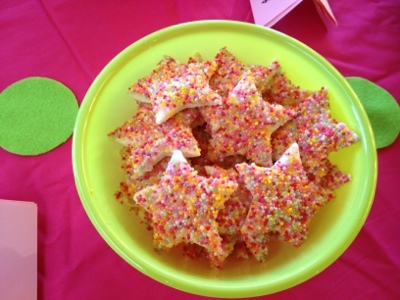 Star shaped fairy bread….for my little shining star! 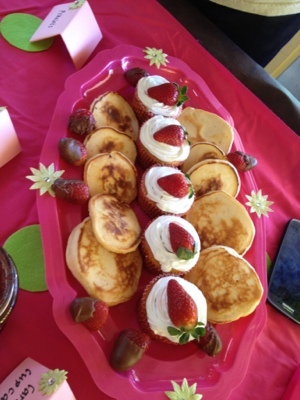 Caramel cupcakes finished with vanilla icing and a strawberry and pikelets with jam and cream! 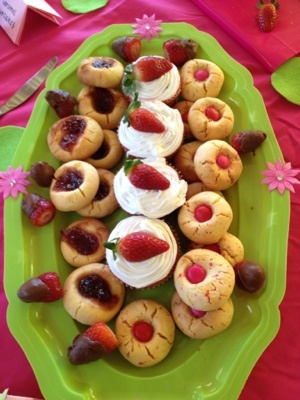 Jam drop biscuits, smartie cookies and strawberries dipped in chocolate! 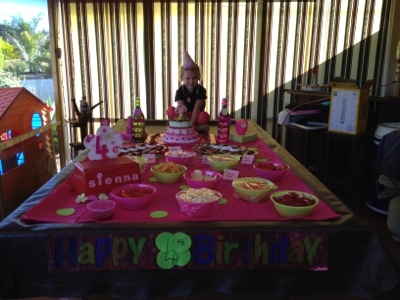 Other foods on her table included her favourite things: popcorn, Cheerios, watermelon, chips and dip! I created little name tags for the food. As a table cloth, I used a hot pink piece of material I had in the cupboard and cut out green felt circles and scattered than out first before I put everything out! The day was a huge success and my reward was seeing how much joy was expressed on my sweet little girl’s face all day long! Happy 4th birthday my Sie Sie girl…you are the light that shines in our party of 5! 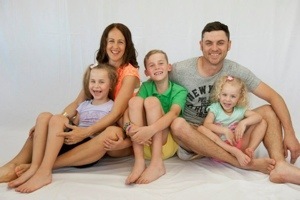 Stay tuned in the coming days when I shall blog some of the recipes I’ve used over the school holidays! Thank you for your kind words:) I’m sure you would be able to! I’ve always been great on the creative side but not so much on the baking side, now I find it therapeutic! Start with small steps and slowly add to it:) I’ve been doing my cakes for 6 years now and when I look back at my first cake to now….let’s just say wow lol! 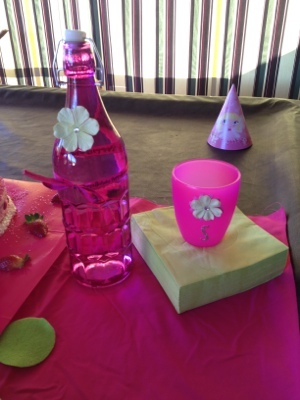 Thank you:) girl’s parties are so much fun! 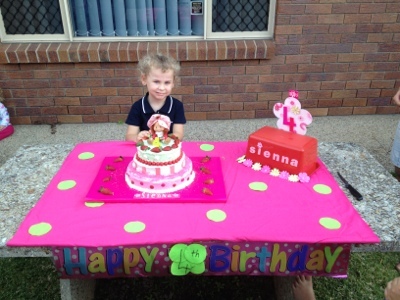 Love the cake! I still have my sister’s old Strawberry Shortcake doll too. And I love that it still smells. Nothing beats a homemade cake and party. Lovely job.